UPDATE: The response to this drive has been overwhelming; we reached 88% of our joint goal on our first day! Our initial goal was to encourage 1,500 people to register consent or check their donor staus. We've now increased that number for a second time to 3,000. Help make this TGLN's biggest-yet workplace registration drive! Thanks to all particiants so far. Did you know one organ and tissue donor can save up to eight lives and enhance another 75? From April 17-26, 2013, Toronto's three transplant hospitals are joining forces to increase awareness about organ donation. Research shows that many Ontarians think they're registered, but aren't. The result? Just over 30% are registered organ and tissue donors. Our goal is to inspire 1,500 people to check their status, and either confirm that they're already registered or register for the first time. Please take two minutes, all you need is your health card number. 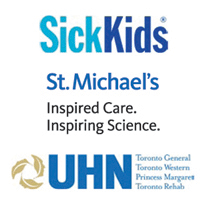 Thank you from The UHN, SickKids and St. Michael's Hospital. Aidez BeADonor.ca/123 à atteindre son objectif.